Q: Why are the shuttles retiring? A: The shuttles are aging and expensive, their key task is nearly completed and NASA wants to use the money spent on them to do something new. They've been flying since 1981, hauling up pieces of the International Space Station. The panel that investigated the 2003 Columbia accident concluded: "It is in the nation's interest to replace the Shuttle as soon as possible." Q: Who decided to stop flying shuttles? A: President George W. Bush made the decision in 2004. He wanted astronauts to go back to the moon, and eventually to Mars. For NASA to afford to build a new spaceship to reach those goals, it had to stop spending about $4 billion a year on the shuttle program. But President Barack Obama dropped the moon mission. His plan has NASA building a giant rocket to send astronauts to an asteroid, and eventually Mars, while turning over to private companies the job of carrying cargo and astronauts to the space station. Q: When does the shuttle program end? A: There are two flights left. Shuttle Endeavour, set to launch Monday, is carrying a $2 billion science experiment to the space station. Atlantis makes the final shuttle trip this summer with spare parts for the station. The third surviving shuttle - Discovery - made its final voyage earlier this year. Two other shuttles - Challenger and Columbia - were destroyed in accidents that killed a total of 14 astronauts. Q: What was the shuttle program all about? A: It was supposed to make getting into space cheap, simple and safe with a launch virtually every week. It didn't accomplish that. But it was the best way to get big items - such as satellites and the Hubble Space Telescope - into orbit and fix them if needed. For the space station, it was a combination moving van and construction crane. What made the shuttle unique was its ability to do all kinds of things. Q: What happens to the space shuttles? A: They'll be shipped off to museums. 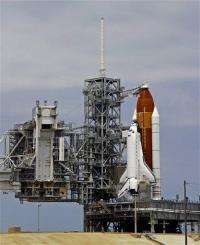 Endeavour goes to the California Science Center in Los Angeles and Atlantis will stay at Kennedy Space Center for its visitor complex. Discovery's new home will be the Smithsonian Institution's hangar near Washington Dulles International Airport. Enterprise, a shuttle prototype used for test flights, goes to New York City's Intrepid Sea, Air and Space Museum. Q: What about the space station? A: The life of the space station has been extended to at least 2020 and it could continue on even longer. It's now big enough for six people. They conduct science research, from astronomy to zoology, and help scientists understand what is needed for longer missions in space, such as going to Mars. Q: What about the astronauts? Do they still have jobs? A: Some will. More than a dozen astronauts will still go to space and live on the space station. Others will wait around for slots on still-to-be-built spaceships, including the ride to an asteroid. Others will leave the program. The same thing happened after the Apollo program ended nearly 40 years ago. Q: How will astronauts get to the space station? A: NASA will continue to buys seats on Russian Soyuz capsules to ferry space station residents. The $56 million price per head will go up to $63 million, which is still cheaper per person than the space shuttle. Q: Is there any other way to get into space? A: Not from U.S. soil once the shuttles retire. NASA could eventually use the commercial rockets and capsules being developed by private companies. Two companies predict they could fly astronauts to the space station within three years. NASA is under orders to build a giant rocket to go beyond Earth orbit. If all that money will be use to find a better and cheaper way to go to space, then.. why took so long? good, we should spend afford improving things on earth before continuing wasting money on space shuttles. We will be using the money on Space Launch system and private vehicles instead, not on Earth, NASA budget has in fact increased a little this year. As for wasting money, NASA is one of the best uses of government money there is, IMHO. I question most of the "facts" presented here - there is little logic in saying that the shuttle was the most efficient way to put station components into orbit. The shuttle program was encrusted with congressional nonsense from the very beginning. It was an inefficient system before the first Enterprise tests. And it got worse.